If you’re looking for fast-paced thrillers with well-rounded characters and plenty of chills, look no further. Peg Brantley delivers. We talk about the inspiration for Red Tide; culture and vulnerable populations in The Missings; her most recent novel, The Sacrifice; and what she admires about her characters. – A WWII novel, Between Shades of Gray, by Ruta Sepetys. Her next novel, Trafficked, is due out this fall. It centers on human trafficking — the same topic I discussed when chatting with Désirée Zamorano, author of Human Cargo, if you’d like to check out our conversation. Don’t forget, if you want a chance to win April’s bundle of books — thriller All In (signed by author Lisa Klink), noir Dead Soon Enough by Steph Cha; and cozy The Diva Steals a Chocolate Kiss by Krista Davis, along with a $10 Amazon gift card, sign up for the monthly newsletter in the boxes on the right. If you’d rather read than listen, here’s the transcript. Enjoy! Welcome to Destination Mystery, a podcast for readers who love a good mystery. My guest today is thriller writer Peg Brantley. It’s no accident Peg Brantley’s thrillers feel so terrifyingly real. She immerses herself in research, interviewing crime scene investigators, FBI agents, and human trafficking experts, and studying topics as diverse as arson dogs and Santeria. She’s gone through the citizen’s police academy and obtained her concealed carry permit, all in an attempt to bring realism to her stories. Her third novel, The Sacrifice, was a finalist for two Colorado literary awards. 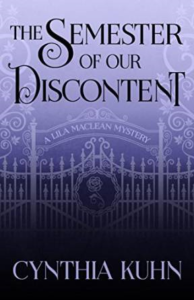 She’s currently working on her fourth novel, the second in the Mex Anderson series. Laura Brennan: Peg, thank you so much for joining me. Peg Brantley: Thank you for asking me. LB: Tell me a little bit about yourself. How did you get started writing? PB: My bonus son had a heart attack when he was 40, no 39 years old, and we moved him home with us. And I lost track of everything else that was going on in my life. I was paying attention to him. And after about a year and a half of that I decided, you know I’ve always wanted to write a book, and I’m home all day. Why not? So it was out of his tragedy, family tragedy, that got my heart where it needed to be. LB: Oh my gosh, I’m so sorry to hear that. PB: He’s doing well now, by the way. LB: That is, that was the question. So your son came home and you had to take care of him and you ended up writing as something for yourself, within that. LB: You know, I find that really interesting because family relationships are such a big part of all of your novels. Are you close your family in general? PB: Yes. Yeah, I really am. You know, I was estranged from my mom for a number of years but thankfully before she died we were able to reconnect and take care of everything. I just think that part of who makes each one of us who we are, are the family dynamics and the relationships that we have with other people. And I try to have my characters be at least a little well-rounded where those are concerned. LB: Family dynamics and family secrets play a big role. So I’m not gonna pry into your family secrets. 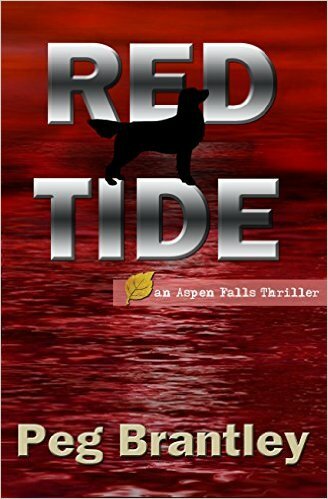 Tell me about the inspiration for Red Tide. PB: I read an article about a man who died in prison. And he left behind a photograph. And the question was, why this photograph? It wasn’t person, it wasn’t a place, it wasn’t an event — well, it was a place. It was a field, just a field with trees around it. But he kept that photograph. And people said, well, there can’t be any special reason for him keeping that photograph. And I thought, well, what if there was a special reason? And it turns out that that is the dumping ground for bodies. LB: Is that what led you, then, to your heroine’s job as a body retrieval specialist? What do they call them? PB: Well, actually she has several dogs, one is a search and rescue dog and then she’s got a human remains detection dog, which some people call cadaver dog, and a couple of others. But she, kinda, it happened all at the same time. I was at a writers conference and I was bored to tears. I found this little quiet corner and the big chair in a quiet part of the hotel and I just started making notes, and they actually came about the same time. But I love dogs and it just kinda was a natural fit. And I wanted a woman who was, was flawed in some ways, but she had a complete motivation for doing what it was that she chose to do with her life. So it just all really flowed very quickly, sitting this little corner of a hotel. LB: It’s magic when that happens. PB: It is. It doesn’t happen very often. LB: Red Tide is your first. And your novels, the way you build them, it’s very interesting. Each one is a standalone, but they all share a location. Aspen Falls, Colorado. The Aspen Falls thrillers. And also you have your characters make cameos in each other’s books. How did you come up with that particular scenario? Because that’s not how it’s generally done. PB: They all did actually start as standalones. But Aspen Falls is such a special place in Red Tide that I didn’t want to lose it. LB: Was it hard to let Jamie go? PB: Jamie’s going to be back! 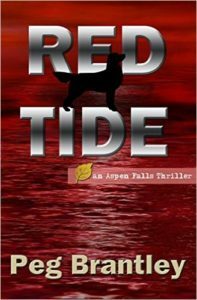 She now has – – and you’ll remember that in Red Tide there was one particular scene where she almost was burned to death — she now has an arson detection dog. Actually, they’re called accelerant detection dogs. So, yeah, she’s coming back. LB: That’s great to hear. And then your second book, The Missings, also set in Aspen Falls, but a very different type of book. PB: Actually that book began, that was like a fourth rewrite of a very old book, you know those that we write and stick in a drawer. And it started off as a women’s fiction. And Chase’s name was Robert Johnson, now he’s Chase Waters. And Robert Johnson was an accountant and now Chase is a police detective. The characters were all pretty much the same. I just was about ready to submit the women’s fiction into a contest, and I thought, what if I win? I’m gonna be stuck writing women’s fiction. So I pulled it and rewrote it to suspense. LB: Well, I like women’s fiction but my problem with writing it is that there’s just not a high enough body count for me. LB: One of the other things that you have played with is the question of identity. And I mean that ethnically, people are trying to figure out who they are based on their race, on their heritage, on their ethnicity, but also on their job, on their losses — people are kind of, everybody seems to be figuring out who they are in relation to other people. PB: I think we’re all still searching. I’m more confident at my age now than I was when I was younger, but I’m still figuring out who I am. If you quote me, date me, because I might switch and become something else at some other point. LB: In your novels, you don’t shy away from issues of culture of race and ethnicity. Why is that so important to you? PB: Well, I think it’s the world that we live in. I think we need to learn how to be — I don’t want to become a preacher. I don’t want to, kind of dictate what people should believe and what they should think about. But I do want people to maybe ask questions and start to have discussions about their own belief systems and where they are with things. Like in The Missings, there’s a lot to do with undocumented people, illegal immigration, and of course that’s a big hot button right now and has been for years and I imagine it’s going to be for a while. But I want people to understand that those are not just illegal people, breaking the law, but those are human beings with lives and hopes and dreams and things like that. So that was a cultural thing I wanted to get across. LB: You also in that, you point out that they are vulnerable because of that. PB: Yup. It’s like, also, prostitutes. We see stories all the time about prostitutes who are targeted for killers, because nobody really cares. And who are the prostitutes going to go to when someone goes missing? They’re not going to go to the authorities. And that’s what happens a lot in The Missings. The people that are going missing are from a culture, a community that keeps hidden. LB: Another way that you use race, it’s very clear people will only really want to talk to people of their own race. Mex Anderson can get into the Latino community in a way that Chase Waters can’t, but he needs his African-American friend to be able to talk to people who aren’t Latino. PB: Well, at the same time, there’s a detective in The Missings is called Daniel Murillo, who is Latino but he has a difficult time loving himself. He has a difficult time loving other Hispanics. And so he has character arc that he has to get over, too. And he would not be accepted in the Latino community, because his attitude is very clear. LB: You have so many rich characters. Each of your books at this point time has a different lead, if you will. Do you have a favorite? PB: Oooh, you know, I kind of like Mex — no, actually Chase — no! I guess I don’t have a favorite. They all have characteristics that I admire. LB: Speaking of Mex, though, he makes his first appearance in The Missings, he is the lead in The Sacrifice. Actually, why don’t we talk a little bit about The Sacrifice. So that one, you did start winning some of those awards. PB: I did. Well, I was finalist. I feel like the Susan Lucci of the writing world. I was a finalist. LB: Well The Sacrifice feels very, not personal to you, but very intensely personal to the lead, to the main character. PB: He suffers from depression, and it’s like, you know, I want to get the D-word out of the closet, and just know that people have it and people can live normal lives with it. So yeah, yeah I admire Mex for what he does. LB: You admire Mex so much you’re actually to write another Mex. PB: Yes. He’s gonna, he and Cade both be involved in the one I’m writing right now regarding human trafficking. LB: So you’re bringing Cade back even though human trafficking isn’t specifically her thing? PB: Exactly. But she still extracts people from cults. She knows how to track people down. She knows how to get them. LB: So let’s talk little bit about Cade. She’s not your main character, Mex Anderson really is, squarely, The Sacrifice is very much his story, but he would never be able to do without Cade. Tell me about how Cade developed as a character. PB: I was going to take part of the story into Louisiana and I needed somebody who was there, was part of that culture. And her real name is Acadia LeBlanc. And she understands the Cajun world. And I needed her. Mex initially thought she was a guy because of what she did for a living and everybody called her Cade, and was a little bit surprised when he found out she was this female who is very, very strong and knew what she was all about. LB: You do a lot of research for your novels. LB: Did you research extraction? Did you research into people who do take, pull people out of cults? PB: Yeah, but that happens a lot. And I went to some, actually there were some seminars here at one of the universities that dealt with that sort of thing, cults and people getting out of cults. Kind of scary when you realize how many of them there are in the country. LB: Yeah, I would imagine that would be very fairly difficult world to get into. Isn’t it a fairly secretive — or are the exit counselors out there and open so that people know they’re around? PB: I think it’s very secretive, from what I could tell, it was very secretive. Now that you mention that, I’m thinking about human trafficking, and those are a little bit more — there are places that are known where you can see that somebody will save me if I go there, so to extricate me from this life. It’s the same thing, kind of a cult, human trafficking is kind of a cult, it’s just that you’re not there by choice when you’re being trafficked. LB: I can’t imagine that that was the most fun thing you’ve ever researched. What was the most fun thing that you’ve had a chance to research? PB: Oh, it’s got to be the dogs. It’s got to be the human remains detection dog and the search and rescue dogs. To learn how they operate and interact with their handlers, is amazing. That was fun, that was fun for me. LB: So when you are not researching, who are you reading? PB: Right now, I’m not reading any suspense or mystery novels. I’m reading, I’m currently reading Beyond Shades of Gray by Sepetys. It’s a World War II novel. And I don’t read those either, but I’m really enjoying this one. It was recommended. So, I’m reading that now. Next up I’ll be reading a cozy and I don’t read those regularly, either, but it was written by friend of mine. 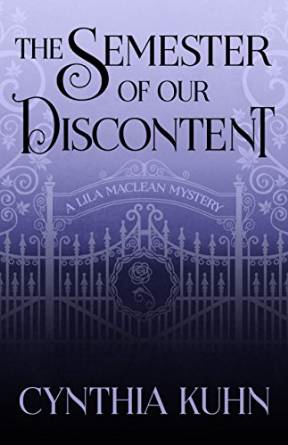 Cynthia Kuhn has a debut novel called The Semester of our Discontent and it is a cozy and it’s been very well received. I’m reading it next. LB: What is your writing process? PB: What I do is, when I get an idea, what I’ve learned have to do is, I mull it over a little bit to see — and I do a stream-of-consciousness thing, where I ask myself questions, I’m writing everything down as I go, it’s like one huge, long, unending sentence, one long paragraph. And by the end of that, I know whether or not I have an idea that’s big enough for novel or maybe it’s small, it should be a short story, or maybe it should just be a blog post. So I do the stream of consciousness thing for very long time and then I do it with each of the characters. LB: How long does it take you to pull one of those together? PB: About a year. I think, about a year to do it. I can do, I have to learn how to do it faster, I need to figure out a process to make it faster. I worked for over two years on one manuscript that I just put away in December. I boxed it up and put it away, because I loved the characters but the story wasn’t working. So when I say about a year, I did work over two years on one that went nowhere. LB: Oh, ouch! What’s next, what’s next for you? PB: Right now, I’m writing a book, the working title is Trafficked. And it’s crazy because I’m writing it in third person and first person present, which is a real challenge for me. I will flip into third person and not even know it for long period of time. And then when I have to go back and write in third person, I keep wanting to make it present tense. And so it’s, it’s just, so that that part of the craft is something that is a real mental exercise for me, but I think it’s working well the story. And that is that, the majority of it, where I’m talking with Mex and Cade, they’re in third person, but when I’m talking about my victims, the young people who are being taken to be trafficked, it’s all in first person because I think there’s just a much more immediate sense of tragedy there. LB: It’s very intimate, yes. Very intimate. LB: Well, I can’t wait to read it. Go write faster. PB: I know, I wish I could! LB: Peg, thank you so much for joining me today. PB: Thank you very much for having me.